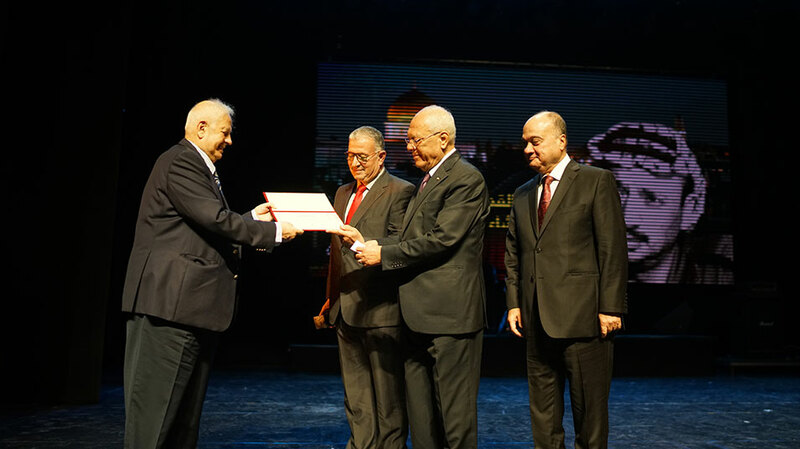 Birzeit University has won the prestigious Yasser Arafat Achievement Award for 2018 in a special ceremony commemorating the fourteenth anniversary of the passing of the late Palestinian President Yasser Arafat. The award honors institutions and personalities who are distinguished by their exceptional work and recognizes real achievements in national, cultural, social, economic, scientific, or academic areas of work. 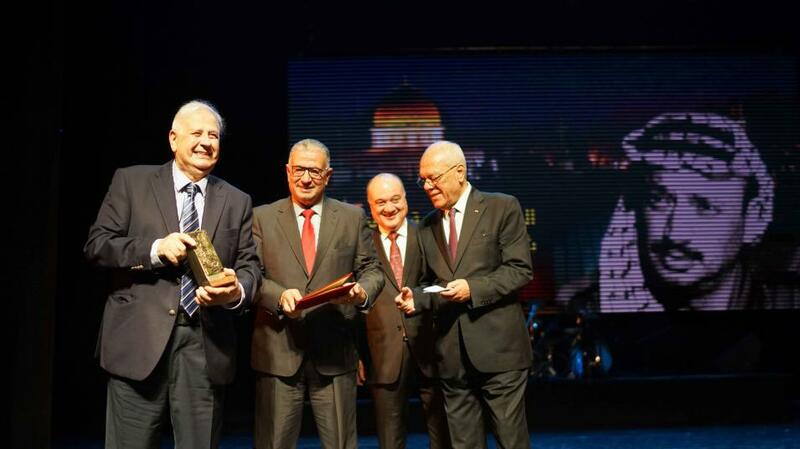 The Secretary General of the Palestinian President's Office, Tayeb Abdel Rahim, and the Chairman of the Board of Directors at Yasser Arafat Foundation, Nasser AlQidwa, presented the award to Chair of Birzeit University's Board of Trustees Hanna Nasir. 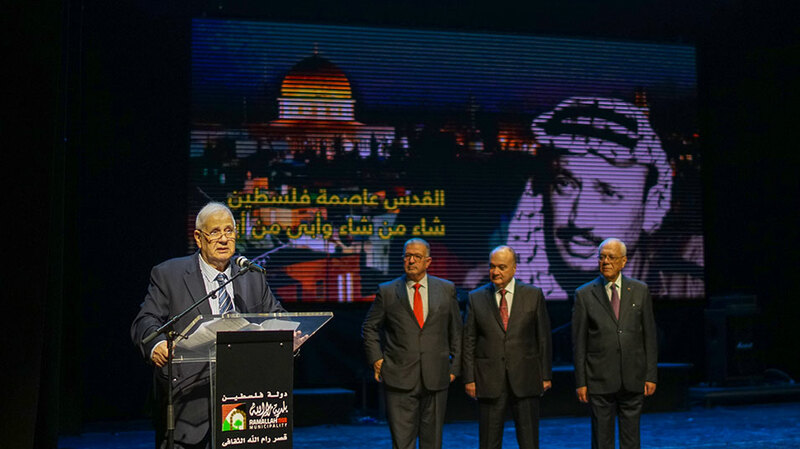 After receiving the award, Dr. Nasir expressed his pride at receiving such a prestigious award ona day when all of Palestine commemorates the death of an iconic leader who inspired and still inspires all Palestinians to attain their freedoms and rights. "This award," continued Dr. Nasir, "is given to Birzeit University just a couple of days after it was ranked as one of the best 50 universities in the Arab region according the QS world ranking." Dr. Nasir, while entering the ceremony at Ramallah Cultural Palace, could not but notice the mural at the entrance of the palace, where Nabiha Nasir, the co-founder of Birzeit School in 1924, sits next to 60 other prominent Palestinian personalities. He commented on that observation in his speech: "Thanks to Nabiha Nasir, Birzeit School was founded, and then developed into a college and then a university. She was a prominent activist in the movement for women's rights, and the values that the school was built on including academic freedom and intellectual diversity, which were solidified in the school by Nabiha, are still the driving spirit of Birzeit." Representing Palestine's president Mahmoud Abbas, Abdel Rahim affirmed in his speech the firm attachment to Arafat's ideals and values. "He is forever in our memory, as an icon and a symbol of the Palestinian's long journey towards liberation."